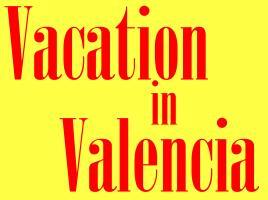 We continue with our coverage of the 2011 family trip to Valencia, Spain. Did you miss Part One? Have a look right here! The Torres de Quart are, with the Torres de Serrano (which we'll get to), part of the remains of the original wall that once surrounded the city... long since outgrown. 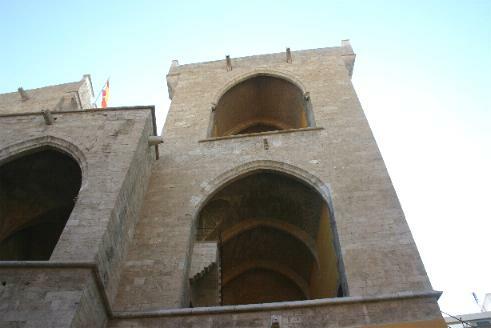 The two remaining towers are among twelve gates that once allowed entry into Valencia. Those indentations in the wall are from cannonballs shot at the towers during wars! An old photo of the towers shows that streetcars used to run through the opening, so it's bigger than might first appear. 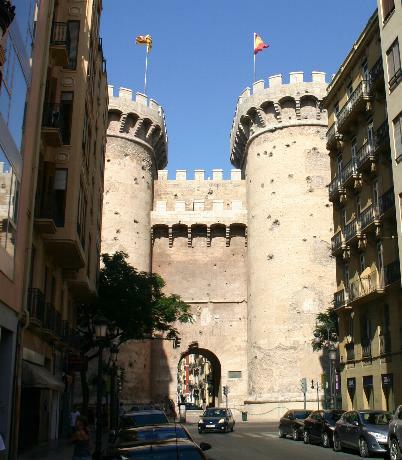 The Torres de Quart appear completely different from the other side, as you can see here. The flag at the upper left is also visible in the above photo. You usually cannot climb these towers, but that's OK, since there is another choice available. Which is where we headed next... the Torres de Serrano. This structure is a bit more open to the public and is on the northside of the old city overlooking the former path of the Turia River. (I'll explain that in a bit.) Construction started in 1392-- yes, one hundred years before Columbus discovered America. It's been used as a defense, a fortress and a prison. Here is an interior shot showing its restoration. 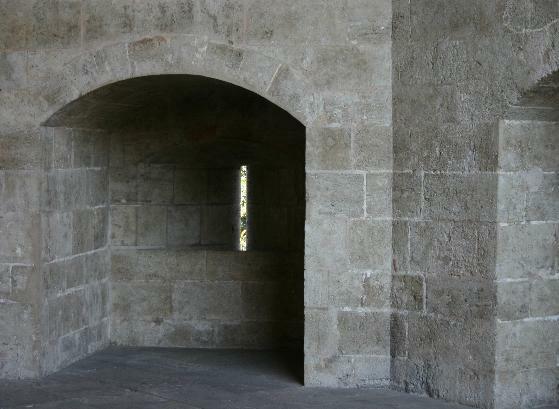 Were you a warrior at the Torres de Serrano, you might be stationed here to help repel the enemy. From the outside, it's just a small opening, hard to get anything through. From the inside, there's plenty of room to observe and manuever. 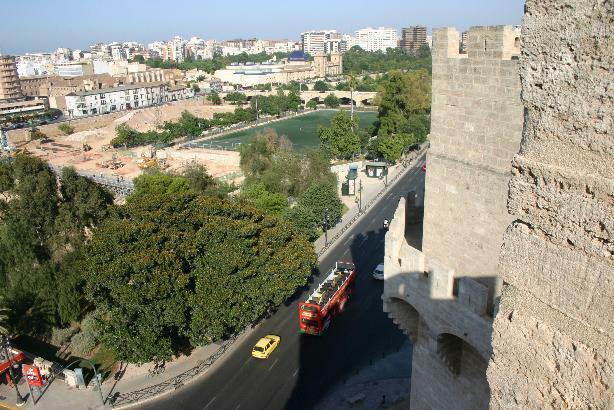 A view from near the top of the towers shows where the Turia River once flowed. A devastating flood in 1957 which indundated much of the city led to the decision to reroute the entire watercourse out of town. 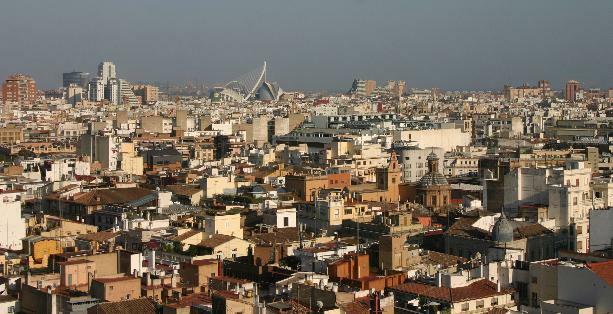 The Turia now flows west and south around the city proper. The former Turia riverbed is now the site of parks, recreational facilities, and Gulliver Park and the City of Arts and Sciences that we saw in Part One. Note the double decker tourist bus; we didn't need one as Rosemary's sister and her family were excellent personal tour guides! With Francisco, my wife's sister's husband, in the background, Thalia and Kieran inspect what I think is a very worthwhile addition to the tourist area of Valencia. 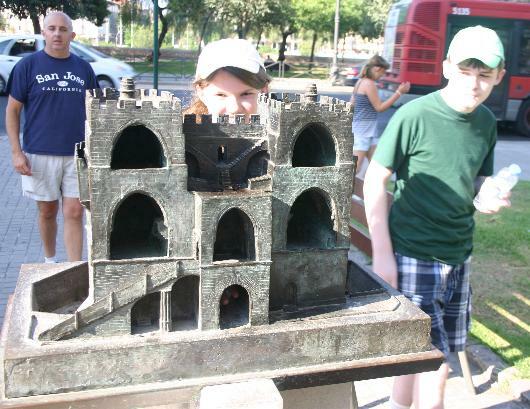 This is not only a scale model of the Torres de Serrano, but it includes a description in Braille. Those who cannot see the tower can still learn about about it and "feel" it and get a sense of what it is like. 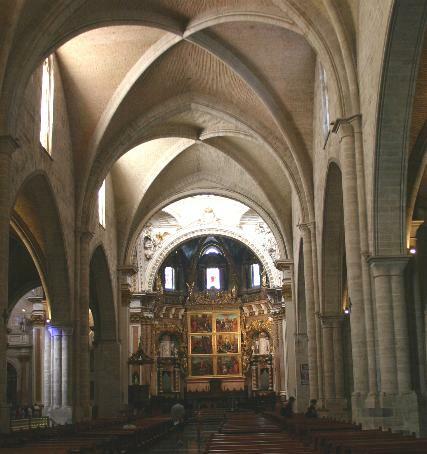 This is part of the interior of one part of the complex that is the Valencia Cathedral (also called the Metropolitan Cathedral-Basilica of the Assumption of Our Lady of Valencia, or, in Spanish, Iglesia Catedral-Basílica Metropolitana de la Asunción de Nuestra Señora de Valencia). 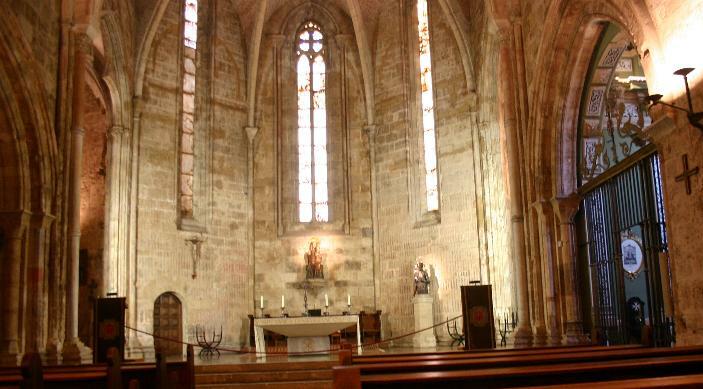 While there have been changes since then, most of it was built between the 13th and 15th Centuries. It was consecrated in the year 1238. 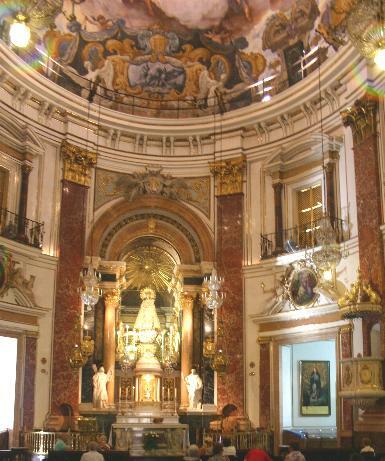 A view of the main part of the Cathedral. 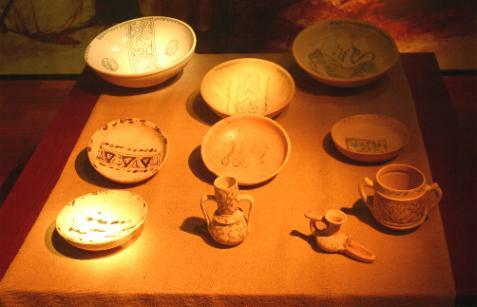 One of the chalices kept here is said to be the Holy Grail, or the one that was used at the Last Supper. Again, digital photographs can't really do this structure justice. There was a mass going on during our visit so I did my best to be unobtrusive, including only using available light for the digital photos (a respectful gesture inside any historic building at any time, in my opinion). 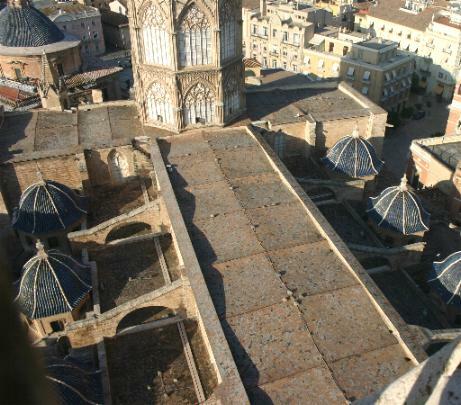 Part of the Valencia Cathedral is "El Miguelete," the bell tower that is reached via a spiral staircase of more than 200 steps. Making that trip is rewarding, as this view demonstrates. The City of Arts and Sciences really stands out from the rest of the city in this image, another contrast between old and new. 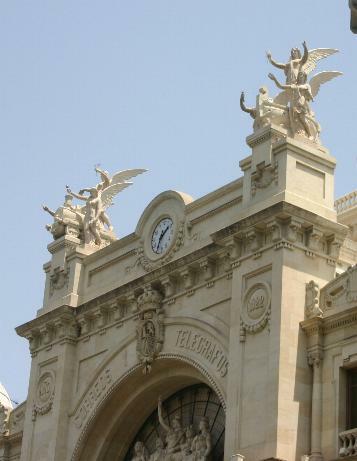 By the way, El Miguelte is depicted in the artwork in the Estacio Del Norte train station; see Page One. But in this view, what catches my eye first is the Torres de Serrano that we'd just visited. Valencia itself is extremely flat, but the mountains rising out of the plain are not that far distant on the horizon. I suppose many photographers at El Miguelete don't point the camera downwards (and with the breeze that evening, it was a bit daunting!) but I had a specific reason to shoot this photo. On the flight over to Valencia, I mentioned that we would probably see flying buttresses. Which immediately led to the question, "What is a flying buttress?" 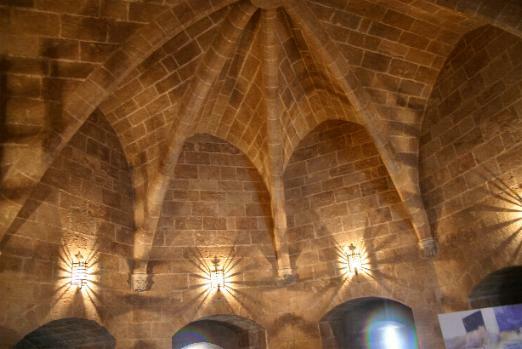 Here's the answer: the arches that support the main walls of the Cathedral. Your preferred search engine should help with more detail. This church is far simpler but is beautiful and elegant in its own way. It is also the church where Rosemary's sister was married. The Stations of the Cross are represented in mosaic form in the courtyard next to the church. 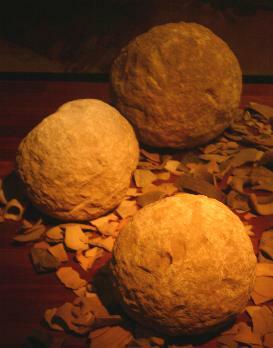 Also at the Museum: CANNONBALL!!! 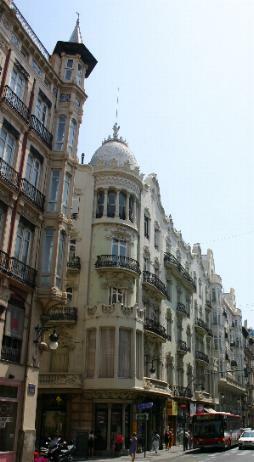 In the old city, there is beautiful architecture practically everywhere you look. Here are just two examples. And by the way, would you be surprised to know on what street this shopping center is located?!? The principal focus of our trip was having the families together, so we did not venture all that far away from Valencia. The farthest we traveled was Peñiscola, about two hours northeast and known as "The Gibraltar of Valencia." It is literally built on a rock-- a very large rock!-- that juts out into the Mediterranean Sea. The castle at the highest point was built between 1294 and 1307 and has quite the history. It is open to the public and we spent a while exploring and enjoying the view. It was a somewhat murky day so this is not a "Chamber of Commerce" photograph; but the postcard I picked up while we were there certainly was. You could almost say that Peñiscola was out of a fairy tale, but understanding its history, that wouldn't be quite accurate. It is no doubt a must see. It still feels a bit humbling to think that I walked around a structure that predates nearly everything in the Western Hemisphere. 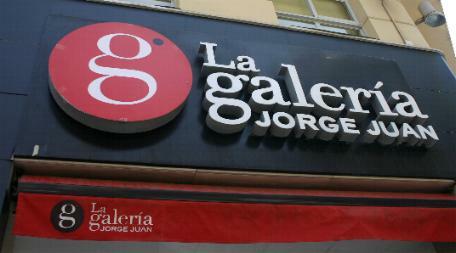 Up until now, I haven't mentioned anything about where we actually stayed while we were in Spain. 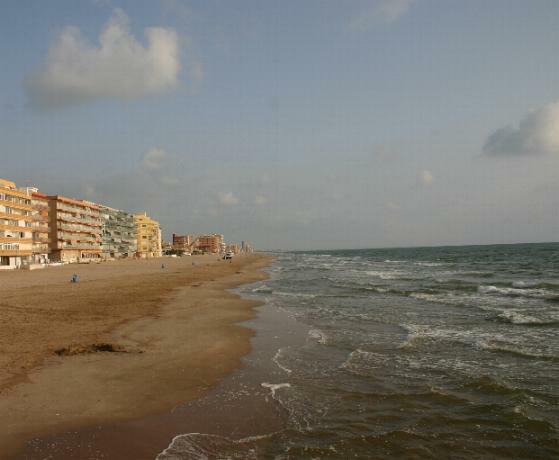 About 25 kilometers south of Center City Valencia is El Perellonet, a residential beach community that is quiet and family-friendly. 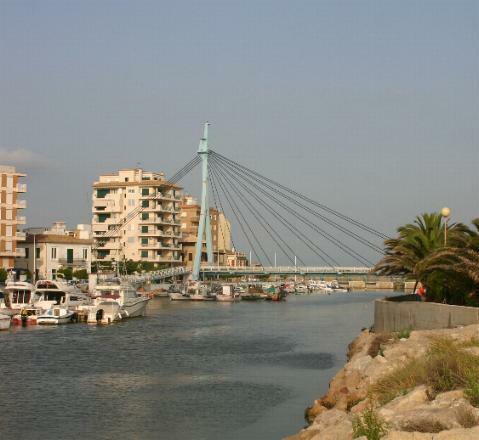 Across a small inlet, spanned by this cable-stay pedestrian bridge, is El Perreló, which is a larger town with shopping, restaurants and a reasonable amount of night life. Both communities are right on the Mediterranean Sea and when we weren't being tourists in Valencia, we were enjoying time on or near the beach, and I was attempting to communicate in my "muy malo" Spanish. The local population was very accomodating. If you're going to be that close to the sea for as long as we were, you have to include at least one photo like this. I walked out onto a breakwater to take this view not long after daybreak one quiet morning. Being in this place was inspiring in a literary way as well. The story of this "Holiday Town" is now in the "Irwin's Journal Online" section of the website, here. And that leads us to the very last photo taken during our trip. It was 5:30 in the morning on the day of our return flight... that's 11:30 PM on the night before, Eastern Time!... 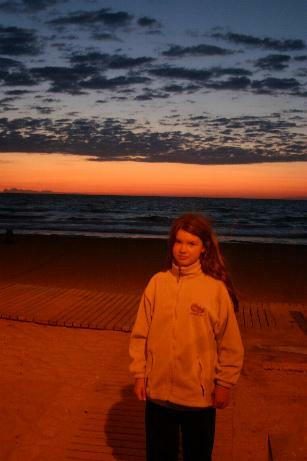 and we took in one last sunrise over the Mediterranean Sea. Thalia looks a bit wistful in this image; we all were. But we will have many memories of our Pleasant Journey. Did you miss Part One? It's here!